Snow had been coming down all day, and continued into the night. I did some shoveling before it got dark and I guessed a foot of snow had already fallen. And still it came. I knew getting my car out in the morning was not going to be easy, but that’s not something I needed to think about at that moment. I’ll leave that for the morning. Instead, I changed out of my sweat-soaked clothing and felt I deserved a treat. 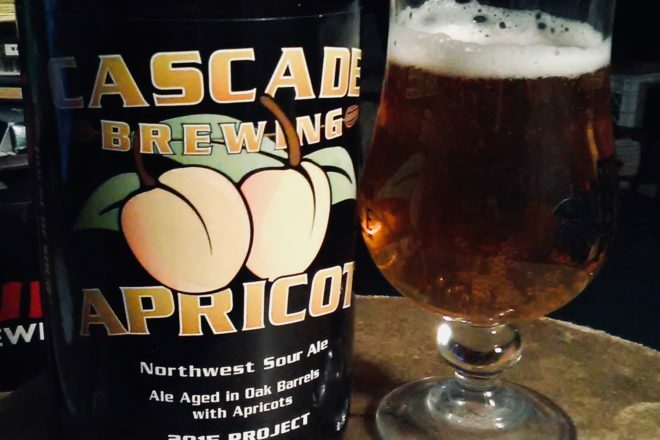 Reaching into the magic fridge, I pulled out a plum, or, more specifically, an Apricot Northwest Sour Ale from Cascade Brewing of Portland, Ore. This ale from the “House of Sour,” as the brewery calls itself, is a 2015 vintage. The base sour blonde ale is aged in oak wine barrels with apricots – seven months alone in the barrels and seven months with 13,000 pounds of fresh apricots for each batch. It’s a 7.2 percent ale. It pours – surprise! – apricot-colored with a big-bubbled white head that quickly dissipates and leaves a lacey curtain of foam on the glass. The flavor is bright, bold, brassy and bracing. It effervesces long and loud in the mouth with prickly sourness. And at the finish there is the lingering and undeniable flavor of apricots. It helps to hold it on your tongue for a moment to get the full effect of the sweet apricots beneath the tangy sour bite. They say 2015 was a very good year for growing apricots in the Northwest – warm, sunny days resulted in fruit with intense character. Yum! This beer leaves an intense sour residue on your lips, so you have a reminder of it later. Now that I’m well into this bomber of sour ale, it has warmed a bit and the apricot now stands out even more, just like popping a round apricot into your mouth. You also get a malty backbone as it warms. I think I started it off too cold, but, not to worry, there’s still a half bottle to get through, and I haven’t thought once about digging out my car in the morning in the bitter cold that is promised. If you are looking for something to do on Valentine’s Day, how about taking a journey to the Heart of Darkness? Paul Regnier and I are assembling an array of dark, darker and darkest beers to sample at the Kress Pavilion in Egg Harbor. Paul is an experienced homebrewer who has led tasting sessions at The Clearing in Ellison Bay for many years. This will be our first joint presentation, and we plan to provide unique and tasty dark brews to warm the cockles of your dark heart. The event takes place 5:30-7pm Thursday, Feb. 14. You can buy tickets at doorcountytickets.com.